Whether it's because of all of the animals or the fascinating story of building a boat big enough for them, the story of Noah's Ark is a perennial favorite for kids. 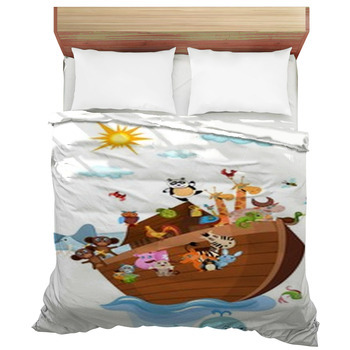 Think how excited they'll be when they can bring the story to their bedroom with a Noah's Ark bedding. 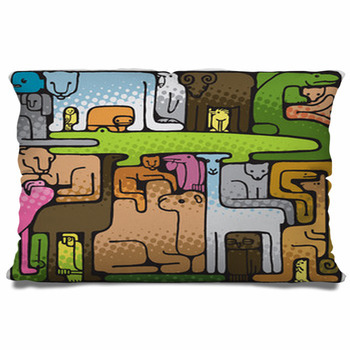 There is so much variety possible with this theme: zebras, elephants, giraffes, monkeys, and many more, either on board or getting onto the ark. 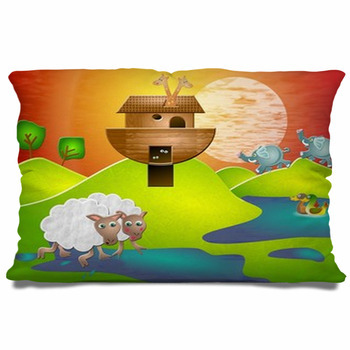 With so many exciting elements, the story of Noah's Ark brings the potential of lots of lively splashes of color. 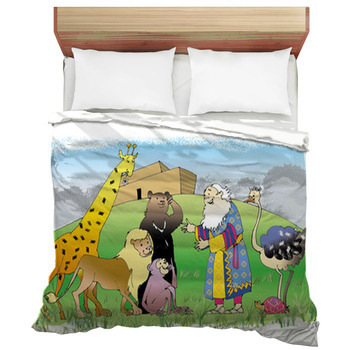 In fact, whatever color scheme you currently have in your child's room can coordinate well with Noah's Ark bedding. 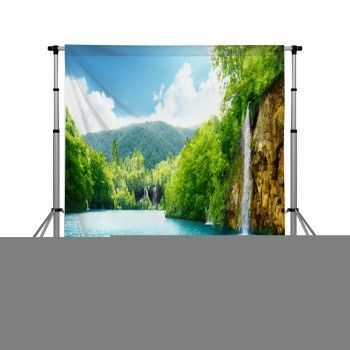 Ready to bring this home to your child's bedroom? Then all aboard! Let's get started. 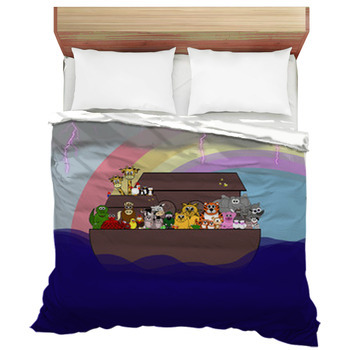 So many aspects of the story of Noah and building his ark for the flood make children drawn to this story, from Noah to the Ark, to all the animals that he brought on board. 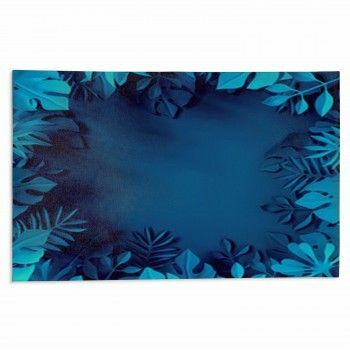 There are so many unique and colorful images depicting the story, all of which will enhance the atmosphere of your child's bedroom. They will love dreaming up names for the creatures and talking to Noah as they play with their stuffed animal toys. 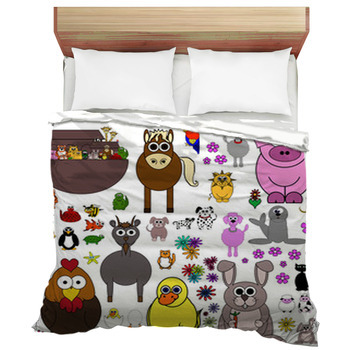 Bedtime stories will be endless and visualized with all the colorful pictures surrounding them in their room. 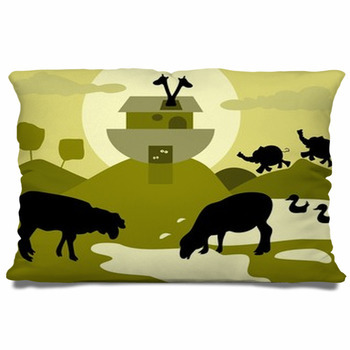 No longer will it be a fight to fall asleep, Noah's ark will help them drift away soundly. 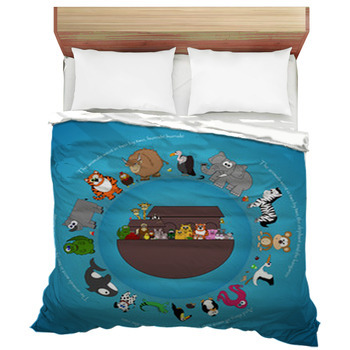 You can also create a personalized bedding set by including a message. Maybe your child's name or a favorite Scripture. Anything you want, we'll print. 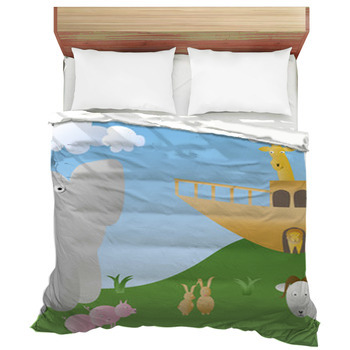 Once your Noah's Ark bedding is on the bed, we're confident that your child will be so excited by all the loveable animals and colors that they'll look forward to bed time. 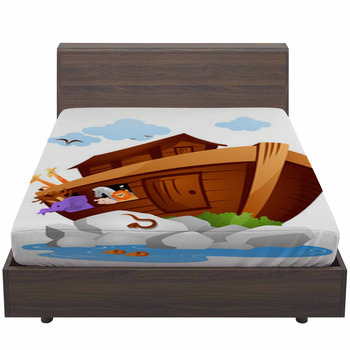 And don't worry: VisionBedding personalized bedding is tough enough to hold up under any child's abuse.